The Alaunts were the dogs of the Alans. The Alans were astounding horsemen, so rated as to provide the cavalry for the Roman legions. In a well known inscription, found at Apta on the Durance, the Emperor Hadrian praises and commemorates his 'Borysthenes Alanus Caesareus Veredus' that 'flew' with him over swamps and hills in Tuscany, as he hunted the wild boar. 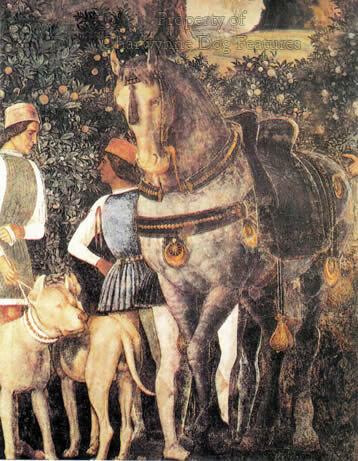 The Romans hunted the wild boar with hunting mastiffs; the Alans would have provided hunting mastiffs as well as horses, their renowned Alaunts. The governors of Milan were once commended 'because...there have sprung up in our region noble Destriers (the war horses of medieval knights) which are held in high estimation. They also reared Alanian dogs of high stature and wonderful courage.' Chaucer did of course refer to 'Alauns' as big as steers; the type was evidently acknowledged here then. As the cavalry for the Roman legions, the Ala ns have left their mark in Britain. The Avon in Hampshire was once called the Alaun, as was the Alne in Northumberland. Allaway in Scotland comes from this source too. In his very informative The Master of Game of 1410, the renowned hunter Gaston de Foix's words on French dogs are reworked by Edward, second Duke of York. He describes the Alaunt as a hound 'better shaped and stronger for to do harm than any other beast'; he made a distinction between mastiffs and Alaunts. He regarded the latter as seizing dogs, the former as big running mastiffs, for use in the chase. 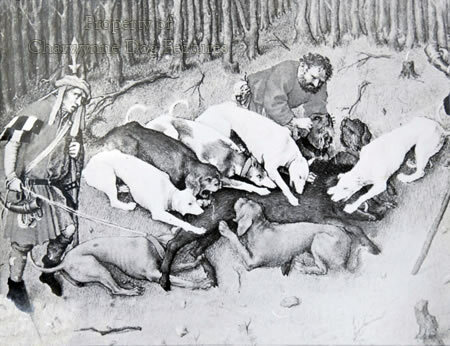 De Foix was the greatest hunter of his time, maintaining a kennel of over a thousand sporting dogs. He would not have blurred mastiffs with Alaunts, he used them in different ways. They had different functions. In England, the name 'mastiff' wasn't in common use until quite a late date, the end of the 18th century; Osbaldiston, in his famous dictionary, utilises the long-established word of Saxon origin 'bandogge'. Scholars are not always reliable sources of information on breeds or types of dog. Sherwood, in his dictionary, defines a mastiff as an alan. Cotgrave, in his dictionary, records: "Allan: kinde of big, strong, thicke-headed, and short-snowted dog; the brood whereof came first out of Albania (old Epirus)". He is confusing the more recent state of Albania with the ancient country also called Albania, near the Caspian Sea. This latter region is the part of the world where the nomadic Alans originated. But Cotgrave's confusion has not stopped subsequent dog breed researchers from firmly linking Alaunts with the Molossian dog from ancient Epirus, adding further confusion. 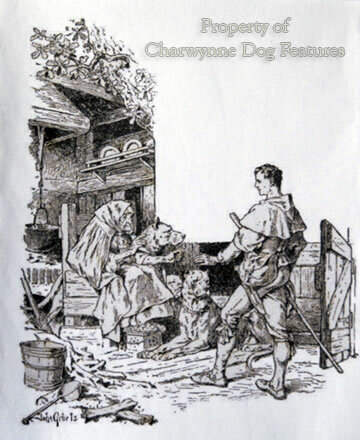 Even worse, Jesse, in his Researches into the History of the British Dog of 1866, like Turbervile before him, presents The Master of Game's descriptions as referring to British dogs, whereas they referred to French ones. But even more misleading to Mastiff researchers is Markham's work in 1616; he tendentiously mistranslated Gratius's Cynegeticon to state that the Romans found 'mastiffs' on reaching the shores of Britain. As the distinguished American historian Jan Libourel has helpfully pointed out, what Gratius actually wrote was: "If you want a good hound, a trip to Britain would almost be worth it. 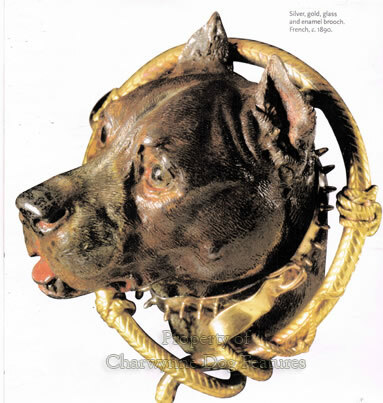 The British dogs may not look much, but for bravery in combat even the famous Molossus does not surpass them." The word mastiff was never used in this much misused quote. A number of enthusiasts have and still are attempting to recreate the medieval type known as Alaunts, of which there were three main types of Alaunts: one resembled a strong-headed sighthound, another the Great Dane and a third the classic 'butchers' or holding dog, rather like the Bullmastiff. To seek to recreate a breed called the Alaunt involves the production of a type spanning say the Greyhound, the Cane Corso and the Bulldog; that would be some achievement. 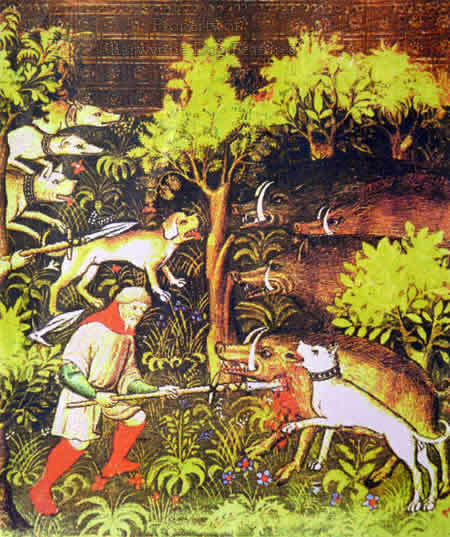 The recklessly brave dogs which closed with the boar in the medieval hunt were boar-lurchers in today's phraseology. The broad-mouthed dogs which survive, the once coarsely-bred mastiff-types developed by show-men into distinct breeds and now being ruined in today's show rings, have a remarkable heritage and deserve all the respect we can afford them.